Opening Lines: High in a land where winds blow snow clouds off tall mountain peaks, Kami stepped out into the early morning dark. He sniffed the moistness. Synopsis: (from the flap) The story tells of a young, deaf Sherpa boy in the Himalaya. His family earns its living by guiding mountain climbers and carrying their gear on yaks. When the yaks cannot be found before a trek, Kami sets off in the high mountains, determined to find them. Despite his fear of being alone in a fierce storm, Kami finds the courage to keep searching. Why I like it: The vivid illustrations are amazing and convey the majesty of the mountain terrain and depict Sherpa society. The story was inspired by a determined little boy the author met while trekking in the Mount Everest region of Nepal. Though he could not speak, he communicated well with creative gesturing. 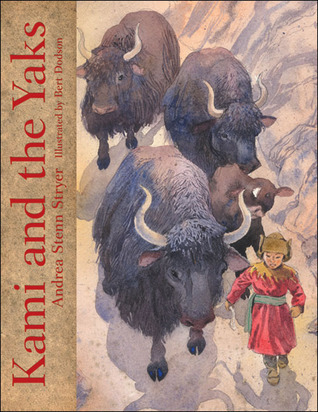 And he loved the yaks especially the littlest one, just as Kami does in this story. I loved most that this author shared the thoughts of Kami, showed us his determination both in surving the storm, saving the Yaks, but also in being understood. I loved that his being deaf and unable to speak was shown not to be holding him back in achieving his goal. A great story showing what we can do if we put our minds to it. I loved the page where it says…. Father put him down in front of Curly Horn. Kami took the big yak’s thick woven collar in his hand. Immediately, the other yaks fell in line. Kami grinned at Father. I did it, and he knows I did it! Kami tugged on Curly Horn’s collar. This left me with a lump in my throat, a really lovely moment. I was also surprised when I finished the story and realised there was no dialogue. Cleverly written and with a back story on the last page this makes for an interesting resource for schools as well. It is not surprising to hear of Andrea Stenn Stryer’s passion for trips to the Himalayas, trekking in Nepal, snorkelling in Great Barrier, and visiting Antarctica, and African savannah. Her previous book is The Celestial River: Creation Tales of the Milky Way. Bert Dodson has illustrated more than seventy books for children and authored two and was an animation designer for a four-part PBS television series .. Intimate Strangers (1998). He also illustrates opera stories for children. This entry was posted in Folklore / multicultural, Picture book, Picture Book Review and tagged Andrea Stenn Stryer, Bert Dodson, Himalaya, Nepal, Sherpa, Susanna Leonard Hill. Bookmark the permalink. Oh my, Dianne, I got goose bumps reading the description. I could hear the mountain winds whistling. I will definitely look for this. Yes, Laura it is beautifully written and I found myself curled up on the couch with a hot coffee reading this a second time. It so draws you in. You will love it. And I also was very moved. It sounds like a wonderful book and I look forward to reading it. Thanks! Your very welcome, Iza. Glad you found this so moving as I did. Sounds like a great book. I’m going to look for it in my library. Thanks for sharing! Your very welcome Barbara. The illustrations are wonderful as is the story. I love this book! Thank you for sharing it. It is such a beautiful story and I imagine the illustrations wonderful. Great choice. Love cultural stories — especially Nepal. I thought you would love this, Pat. The fact he is both deaf and cannot speak, he still manages to communicate, even though they have no sign language of their own in Nepal. Interesting what he uses to help him communicate with others. I loved this book, I am sure you will too. Sounds just wonderful and I can already feel the relationship Kami has with his yaks. I thought of you when I was reading this book. The wildlife, rugged mountains, nature, adventure. Hmm… I could just see Joanna up there experiencing this life. I am sure you would like this one. Hi Catherine! It is a lovely story and yes it was a trip to Nepal to trekking in the mountains that led to this story. Amazing isn’t it! I love the cover! I just learned what/who Sherpas are! I am going to look for this one at the library! Hi Erik! It’s a great story and also a great tool in learning about Sherpa lifestyle. I am sure you will find it very interesting. Happy hunting! This sounds like a really lovely story. I don’t know anything about yaks. Except they’re big and hairy. I do know something about sherpas. They carry things. I guess yaks do too? I think I’ll be checking this book out! Thanks for sharing! Yes it is a lovely story, Rhythm. The yaks help take all the equipment needed up in the mountains for the climbers. It’s hard work. You will find it very interesting indeed. This really looks and sounds fabulous, did not hesitate putting it on hold at my library! Thanks for your pick! 🙂 Glad you liked it, Julie. It is a beautiful story. I hope you enjoy it too. I’m so glad you added this to the list! I can’t wait to find it! Thank you Penny, I hope you find it.